Weather and climate extremes make the Australian environment particularly harsh in some regions. High temperatures, low relative humidity and strong winds can combine to create ideal conditions for the rapid spread of fires in rural and semi-rural areas. It’s not just properties in the direct path of a fire that can be affected. Many homes are damaged by ember attack, where burning twigs and leaves carried by the wind land on or around a property and set it alight. 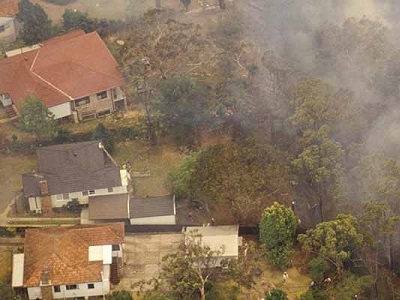 To protect your home from a potential bushfire, it’s important to be prepared and to have an escape plan. Preparation includes precautions you can take ahead of time while Escape is about knowing what to do when you need to evacuate. Ensure you have smoke alarms installed that match the current legislation, and are working and properly maintained. Crimsafe fire attenuation screens provide excellent protection from ember attack, reduce radiant heat, and protect glass from the impact of burning debris. Crimsafe’s Tensile-Tuff stainless steel mesh is specially designed to a size and shape (1.5mm x 1.5mm aperture) that meets the requirements of the Australian Standard AS 3959-2009 bushfire protection guidelines and prevents ember penetration during bushfires. Crimsafe’s Safe-S-Capes is a keyless emergency exit system that secures your windows against intruders, but still allows you to get out quickly and easily in the event of an emergency. Safe-S-Capes can be hinged or sliding, making them suitable to fit hinged, sash or sliding windows. The one-touch release system ensures your fast escape, without compromising its exceptionally strong security.